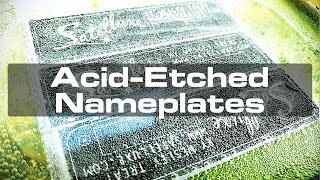 To make custom nameplates for my work, I use a toner transfer process to etch graphics into aluminum. The toner is fused onto the aluminum using a laminator. The covered areas are protected from the acid, leaving the exposed areas to become engraved. For more detailed notes on the process, see the video description for my video on making custom circuit boards: https://youtu.be/p9Umk5aG8Y4. ▶ Why didn't I just etch all the nameplates as one piece, then cut them? Well, I tried that once and discovered that trying to etch too much metal at once causes too strong a reaction. The stronger the reaction, the more heat is produced, which strengthens the reaction even more, and the whole thing bubbles out of control, causing all the toner to slough off. ▶ For this batch of nameplates, I used Pulsar Toner Transfer Paper, especially made for the process, but you can also use the less expensive HP Glossy Premium Presentation Paper, although it doesn't slide off as cleanly. See above for links. ▶ I don't have a good metal shear, so I cut the aluminum blanks by first scoring them with a plastic-cutting knife, then bending them on my brake. ▶ Lightly sanding the aluminum isn't totally necessary, but it gives the metal a little tooth for the toner to stick better. ▶ I usually run the nameplates through the laminator 6-8 times, flipping them over each time. ▶ The ratio for the acid solution is 2 parts hydrogen peroxide (available at any drug store) to 1 part muriatic acid (available at nearly any hardware store). ▶ The packing tape prevents the backs of the metal from the acid, which, as I explained above, would cause a stronger reaction if exposed. ▶ The fan serves two purposes: first, it blows the vapor produced by the acid away from my face, and second, it tends to keep the acid from getting too hot. ▶ The clear coat protects the Lacquer-Stik from wearing off and prevents corrosion of the aluminum. New method for etching brass dials - great detail!